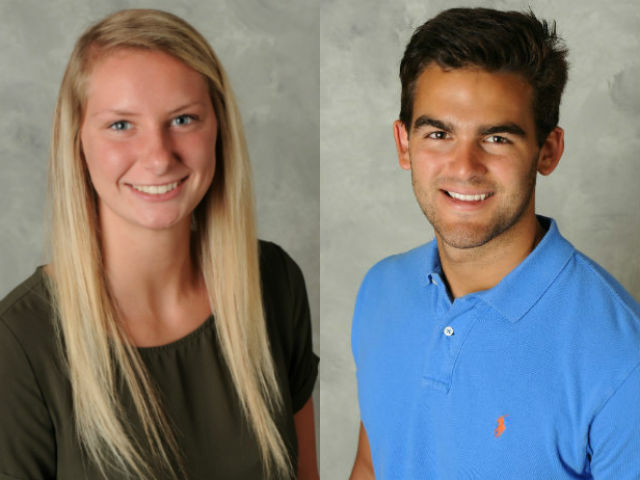 CINCINNATI – Cooper basketball record-holder Lexi Held and Covington Catholic dual-sport star AJ Mayer were named LaRosa’s High School MVPs of the Year for the 2017-2018 school year. The two were announced at the 43rd annual LaRosa’s High School Sports Hall of Fame induction ceremonies at CET studios. Held, a varsity basketball player since the eighth grade, leaves Cooper with 30 school records. She is the school’s all-time career scorer with 2,430 points and topped the charts in assists, steals, field goals, free throws, blocked shots and numerous other records. Held averaged a 28.2 points a game last season and set the school’s single-game school record of 43 points. She helped propel the Lady Jaguars to their first 9th Region championship in school history. Held is going on to play at DePaul University. Mayer helped the Colonels capture the Kentucky state championships in both football and basketball in the same school year. That feat has been accomplished only two other times. With Mayer at quarterback, the Colonels had one of the most dominating seasons in Northern Kentucky history, going a 15-0 with game point differentials so large that the Colonels went to a running clock in all 12 games against Kentucky competition. Mayer finished with a school-record 7,602 passing yards and 77 touchdowns. His 3,114 passing yards and 40 passing TDs last season set single-season school records. In basketball, Mayer helped lead the Colonels to a 35-4 record. He scored 12 points and had a team-high eight rebounds in the state championship win over Scott County. Mayer will play football at Miami University. Coach Mike Yeagle, football, Beechwood,1991-2005. For the first time ever, LaRosa’s inducted two legendary teams into the Hall of Fame –the 1976 Moeller High School football team and the 2003 St. Ursula volleyball team.